I had an interesting dinner in London last week. I was there on business, as my real life company is based near Oxford, and we were hosting customers from Japan. There were 10 of us, a few of which had some wine drinking experience, but also a few novices. Our CEO turned to me and asked me to order wine for dinner, letting everyone know, especially the VP from our Japanese customer, that I was a wine expert, even writing about wine. No pressure! I just have to order wine for 10 people that have a variety of tastes, a range of wine experience, and are undoubtedly ordering different meals. Of course, as we’re a very small company, I need also to be conscious of price. Open the wine list, and start going through it. There are certain expectations and constraints going in. I’m expecting not to find any reasonably priced California wines, so I’m already a little out of my comfort zone. (In my experience, very little California wine is available in England.) I’m also not going to be getting a French Chardonnay (white Burgundy) or Cabernet Sauvignon (Bordeaux), as these wines will not necessarily go with all the meals. So I’m looking for something fresh and crisp in a white wine, and something not too big in a red, but big enough to handle the lamb dish which is the special for the evening, and will probably be ordered by more than a few people at the table, including me. For the red, I had a pretty good idea what I wanted: a nice Rhone (Syrah-based wine). I had spotted one that I thought would do nicely. The somm suggested a different wine, saying that the one I had chosen might be a bit too big of a wine for everyone to enjoy, but his alternative, also from the Rhone (Cotes du Rhone area), was a GSM – Grenache, Mourvèdre, Syrah – blend and would be more likely to a crowd pleaser. Again, a few pounds less expensive per bottle. The lamb special was delicious: lamb shoulder roast brought to the table on a cart and carved table-side. 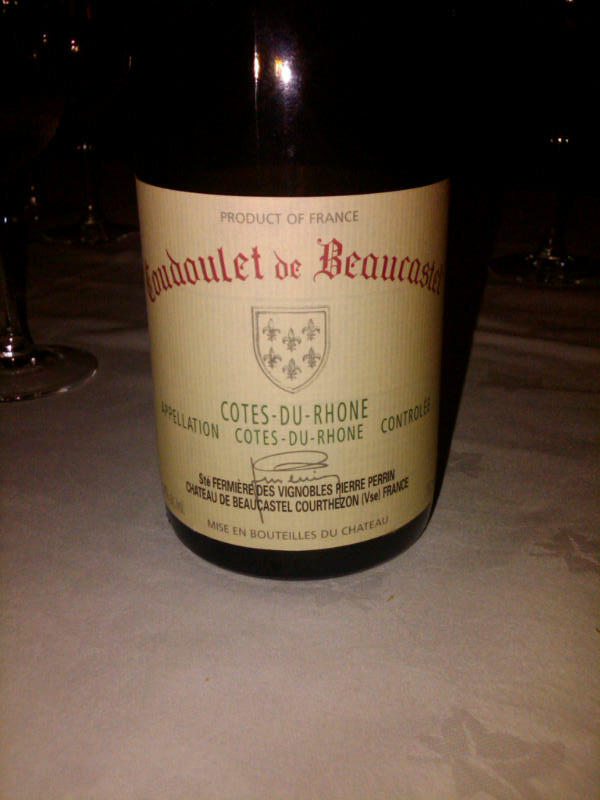 The red wine was 2009 Coudoulet de Beaucastel, owned and operated by the same family that owns/operates Chateau de Beaucastel, which is maybe the best, if not the best known, wine from Chateauneuf du Pape in the Southern Rhone. Coudoulet is “right across the street” (according to the sommelier) from Chateau de Beaucastel, and that street is the demarcation line for the Chateauneuf du Pape region. This wine contains Cinsault in addition to the GSM grapes, and similar to the Chateau de Beaucastel has a comparatively high Mourvèdre content. This is exactly what the good sommelier should do: listen to his customers, understand their needs, and help choose great wines for the specific customer. Whether you know a lot or a little about wine, don’t hesitate to use the somm. This entry was posted in food and wine and tagged beaucastel, cotes-du-rhone, muscadet, sommelier on July 27, 2014 by vvblogman. While Lori and I were in the Santa Ynez Valley for the Wine Bloggers Conference, we took ourselves out to dinner to celebrate our anniversary. My brother and his wife recommended the Mirabelle Inn Restaurant, in nearby Solvang, where they had eaten within the last year. With no other information to go on, and because our tastes are similar, we went with it. Great choice. It turns out that the Mirabelle has a tasting menu, including wine pairings. 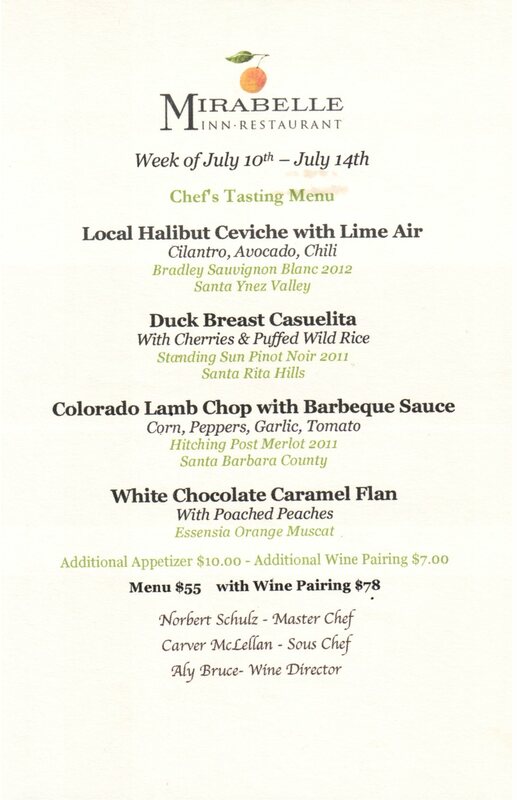 The menu for our meal is shown above, including the wine pairings, which we had. Photos of the individual dishes are below. Each dish and wine were great individually and paired together. It’s hard to say which would be my favorite. Maybe the ceviche, as I’ve long held that I could live on ceviche and margaritas and nothing else. But the duck was so good, not too sweet, and they gave us a spoon for the sauce. The lamb was cooked perfectly, and I didn’t care how fancy the restaurant was (maybe 8 on a 10 scale), I was going to gnaw on the bones. I’m not a real lover of white chocolate, nor of flan, but perhaps the best course was the dessert with the Muscat. The Mirabelle dining room is quaint and small, with only about 12 tables. If you’re in the area, I’d highly recommend making a reservation at the Mirabelle for dinner. This entry was posted in food and wine and tagged Mirabelle Restaurant, Santa Barbara County, Solvang, tasting menu on July 20, 2014 by vvblogman. Being at the Wine Bloggers Conference in the Santa Ynez Valley (Santa Barbara County) this past weekend got me thinking about our long ago time living in the area and tasting Santa Ynez Valley wines. Lori and I lived here from 1982 – 1985, and again 1990-1991. We came here with one son, born just before moving here the first time, with the second one born in the middle of our first stay in the area. There are many memories from our stays, but one that stands out is our first time tasting Pinot Noir. Not just our first time tasting Pinot Noir in the Santa Barbara area, but our first time ever tasting Pinot Noir. While I started drinking good wine relatively young – thank you Father and Uncle – most of the wine was Cabernet Sauvignon and other Bordeaux varietals and blends. Pinot Noir, even though it was being grown in California, in the Carneros district, just wasn’t around. Then, when Lori and I were living in upstate New York, in the Finger Lakes region, we enjoyed the cold weather white wines that are made there. Still no Pinot Noir. Sometime early in that 1982-1985 period we visited the Sanford and Benedict Winery, which was the only winery on the west side of the 101 highway, closer to the ocean, in what is now the Santa Rita Hills (SRH) AVA. We rolled up, put the baby (the future Winemaker B) in the baby carrier on my back, and walked into the barn that served as their winery. There was no electricity, and so wines were made strictly with gravity flow techniques, with the barn kept cool by running water over the roof of the barn. Michael Benedict was there, and walked us through a couple of fantastic Pinot Noirs, teaching us about Pinot Noir in general, and their Pinot Noir specifically. It was romantic and idealistic in a back-to-nature sort of way, the wines were wonderful, and we had spent an hour chatting with a winemaker instead of at the counter of a tasting room. Voila! Pinot Noir was added to the range of wines that were really special in my heart. By the way, that area, the SRH AVA, has now become one of the best areas for Pinot Noir in the world. See my Pinot Noir Heaven post. This entry was posted in wine tasting and tagged Pinot Noir, Sanford and Benedict, Santa Barbara County, Santa Rita Hills, Santa Ynez Valley on July 18, 2014 by vvblogman. I thought I’d died and gone to Pinot Noir heaven! A few nights ago during the Wine Bloggers Conference, I got on a bus with 20 other bloggers for a journey to an unknown destination. 15 minutes later we were at the Melville Vineyards and Winery estate, for a few hours of Pinot Noir heaven. We started with a vineyard talk from Chad Melville, one of the two sons of the founder involved with the vineyard and winery. 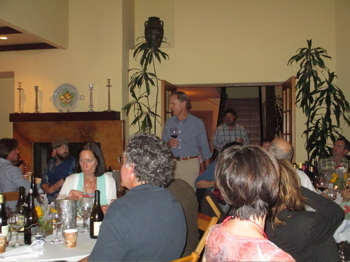 Interesting talk, from one of the top Pinot Noir producers in the Santa Rita Hills (SRH) AVA in Santa Barbara County. They use some different trellising, pruning and canopy management techniques. However, the primary factors influencing the grapes are the climate — the east-west running valleys that bring in the cool air from the ocean — and the soils. We finished with a great meal in the Melville tasting room, with halibut and pork paired with the great wines we had, and then walking out to a full moon over the vineyards. Pinot Noir, well-made and aging, just beautiful and delicious and balanced. The 2012s were in general pretty good, but still young. Give them a few years. A special mention should also go to the 2007 Carr Pinot Gris. Carr doesn’t make a Chardonnay, and so brought Pinot Gris instead, and there was a tuna tartare being passed right when I went to try the Pinot Gris. Delicious pairing! Who would have thought that Pinot Gris could last for 7 years? What a night. Pinched myself a few times to make sure it wasn’t a dream. This entry was posted in wine tasting and tagged Alma Rosa, Babcock, Brewer-Clifton, Carr, Lafond, Melville, Pinot Noir, Santa Rita Hills on July 17, 2014 by vvblogman. Just had brunch at the Wine Bloggers Conference, sponsored by the Wine of Portugal. They did a variety of pairings of Portuguese-influenced food — Portugal, India, Brazil, Japan — and Portuguese wine. My favorite was the pairing of Indian food with Portuguese white wine. 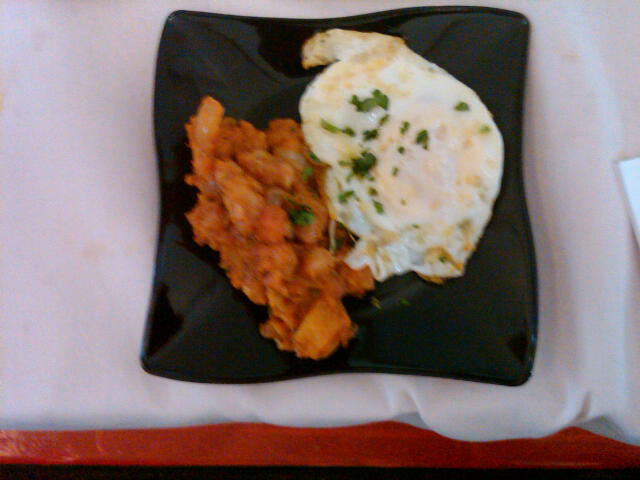 Specifically, the dish was called Mathunake Dudkiwale Aloo, which apparently means over easy egg served over a curry of potatoes, chick peas, onions and more. I had this with the Anselmo Mendes (that’s the winery/winemaker) 2013 Passaros Loureiro Vinho Verde. The food was rich, spicy, and wonderful, and the wine had the fruit and acid needed to cut through the flavors, and complement the flavors. A great pairing, and a great way to start off the day. This entry was posted in food and wine and tagged Anselmo Mendes, Indian food, Loureiro, Portugal on July 11, 2014 by vvblogman. Lori and I went and saw the movie “Chef” yesterday. Fun movie, and I’ll pass along the advice we received from everyone else: Don’t go hungry! The food in the movie looks great. One interesting thing in the movie was the choice of wine. To set the scene, Dustin Hoffman is playing a restaurant owner, seemingly a relatively high end place. Oliver Platt is a reviewer, who has given the restaurant a lousy review, and is now back for a second review. Jon Favreau, who was the chef, has quit the restaurant after Dustin Hoffman made him cook the same old menu for the first review, instead of the innovate menu Favreau wants to cook. Dustin Hoffman offers the reviewer a glass of “2009 BV”, saying that this was a gift from the winery. I’m sure BV (Beaulieu Vineyards) paid for the product placement, but irrespective of which winery it was, a 2009 is a subtle choice. It’s a very good year for Napa Valley Cabernet Sauvignon wines like BV, and while it should taste good now, it will taste better in a few years. If Hoffman was a really good restauranteur, and wanted to impress the reviewer, he should have better (more drinkable) wines to offer. But Hoffman is not that good, just thinks he is, and the choice of wines subtly reinforces the point made in the movie. Nothing against BV, as their Tapestry blend is one of my go-to wines (can’t go wrong if you choose this wine) on restaurant wine lists, just making the point that this was an unusually perceptive choice of prop for a movie. After the movie, which we saw at the Vine in Livermore (great theater), we headed back home. Except that on the way home we saw a sign for a brewery, and it was a hot day, and we were thirsty, and that was about all the excuse we needed to follow the signs. 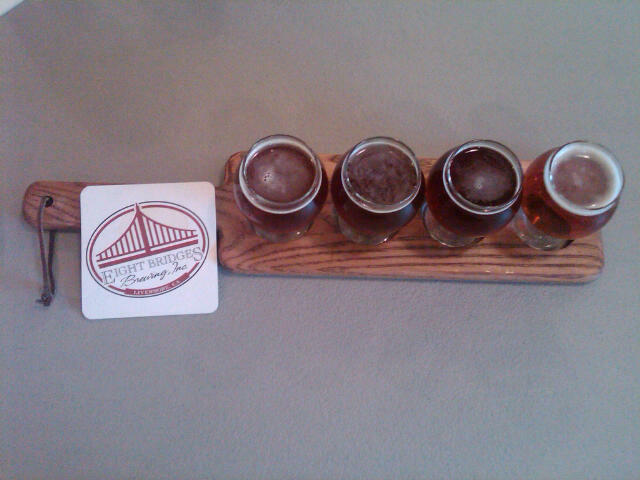 Eventually they led us to Eight Bridges Brewing in Livermore. Their brewery and tasting room is located in an industrial park near the airport in Livermore. We found a nice crowd inside, drinking beer and playing bar games. We joined in on the beer drinking, trying everything except the stout. 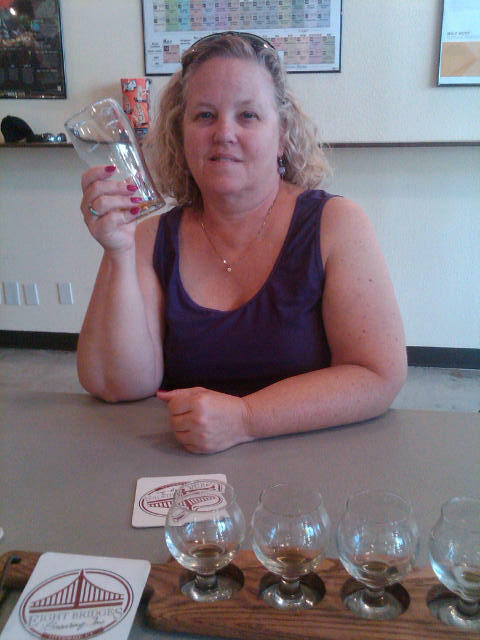 Lori’s favorite was the Golden Nektar, a Bavarian style pilsner. While I enjoyed the Red and the IPA, my favorite was the Fyrst RIPA. As explained by George, behind the bar, this was originally supposed to be a Red. However, by the time they got their permits, they couldn’t get all the original ingredients, and when it was done it seemed a cross between a Red and an IPA. Thus “RIPA”. Seriously good, nicely balanced beer. I’ll be coming back for more. Try it out for a break from wine tasting. First the samples, then the empties. This entry was posted in beer, food and wine and tagged Chef, Eight Bridges Brewing, Livermore on July 8, 2014 by vvblogman. July 4th yesterday, and instead of heading to Santa Cruz Lori and I were home with a sick cat. Not what we had planned, but we had to make the best of it. So we watched some World Cup games, some baseball, just generally relaxed, and planned our own little barbeque. A rack of ribs, corn on the cob, homemade cole slaw. Lori’s got a great recipe for the slaw, which involves garlic powder in the sauce. (If you’re interested, you should ask her.) For the ribs we used some plum BBQ sauce that we made a year ago. The recipe for that is on the Food and Wine Pairing page of the main website, and it was great with the ribs. For wine, we pulled out a bottle of 2004 Peachy Canyon Winery Zinfandel, Old Schoolhouse Vineyard (Paso Robles). Obviously, we decanted the bottle. It took about 30 minutes to open up, then had everything: great nose, fruit on entry, nice and chewy texture, good tannins on the finish. Bite of ribs, sip of wine. Rinse and repeat, to borrow from other instructions. Good Zinfandel can age, and age well. Maybe not the 20+ years for the high end reds, but this had everything I want in a wine, including the complexity and balance. Better now than it was in the first few years after bottling. 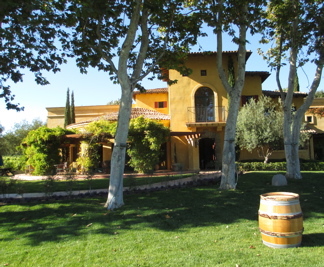 Of course, you have to start with good zinfandel, and Peachy Canyon is a great winery to keep in mind for Zinfandel. 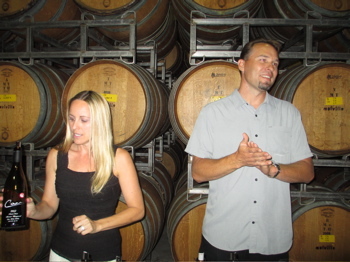 Always an enjoyable tasting experience too, if you get to Paso Robles. I hope you all had a great holiday yourselves. This entry was posted in food and wine, Zinfandel and tagged aging wine, BBQ sauce, Peachy Canyon Winery, zinfandel on July 5, 2014 by vvblogman.